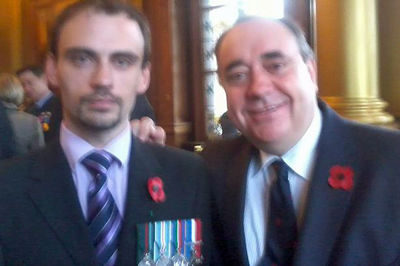 Walter Mitty pub chef pretends to be hero soldier and grabs a snap with Alex Salmond ... CHEF Alan Clayton is no SAS soldier - he borrowed a mate's chestful of medals for a Remembrance Ceremony event. THIS is the moment Alex Salmond met a “Walter Mitty” passing himself off as an SAS soldier. The First Minister proudly posed for a photograph with the goatee-bearded Special Forces “war hero” and his chestful of medals – but Alan Clayton is in fact ... a pub chef. The nearest he is likely to have come to a battle is if there’s ever been an unhappy diner in Shebeen, the South African-themed bar in Leith where he cooks. Clayton borrowed his row of commemorative medals from the Reverend Bill Mackie – a former soldier who now runs online Bible classes. The snap with Salmond was taken at a Remembrance ceremony in Edinburgh last November 2011. In another photo at the same event, Clayton is seen standing next to 58-year-old Mackie and his wife Heather, 53, in front of a war memorial on the Royal Mile. The four medals he is wearing can all be bought online. 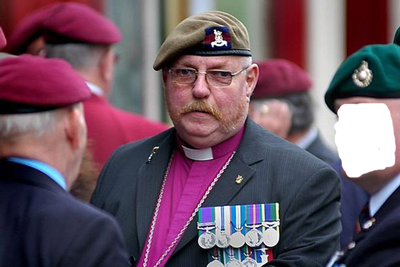 Mackie – who has in the past represented veterans’ organisations – normally wears nine medals in two rows. He lent Clayton his lower group for the ceremonies. Clayton has posed as a decorated war hero more than once. In another photo, he is in a restaurant wearing a different shirt and tie but the same SAS beige beret with a poppy behind the cap badge. A disgusted Army veteran alerted the Record to the imposter after seeing our story about bogus “Para” Bob Campbell in May. Campbell, 59, from Aberdeen, claimed to have twice won the Military Medal – one of the highest awards for valour – when in fact he bought the prized decoration from a shop. Our source said Mackie and Clayton were often seen at One O’Clock Gun Association ceremonies in Edinburgh. He added: “It’s disgusting what Clayton has done – he has never been anywhere near the SAS and is flouncing around giving it the big one to the First Minister. Our source pointed out another mistake made by Clayton and many other “Walters” – the name real servicemen give to charlatans who pose as veterans. He said: “Every soldier worth his salt knows that the SAS beret badge is made of cloth – it isn’t metal. Guys who serve with the regiment rarely if ever wear them in public. Walters like Clayton don’t seem to understand that.” The Australian SAS use a metal version of the winged dagger and “Who Dares Wins” scroll. Clayton may have bought the badge from dealers in militaria. Mackie’s online CVs say he served with the TA between 1971 and 1973 before enlisting in the Army Pay Corps. He claims to have served for nine years, during which he was attached to the Scots Guards for several tours of duty in Northern Ireland. The father-of-four also maintains that he is a consecrated bishop of the Celtic Church in Ireland and a major general in the US-based Chaplain Fellowship Chaplain’s Corps. He also claims to have been a self-employed security consultant running anti-terrorism courses. Mackie was involved with the Scottish Veterans’ Association but left about two years ago. An SVA insider revealed: “The Reverend Mackie and Alan Clayton left the organisation under a bit of a cloud after a number of disagreements with the committee. 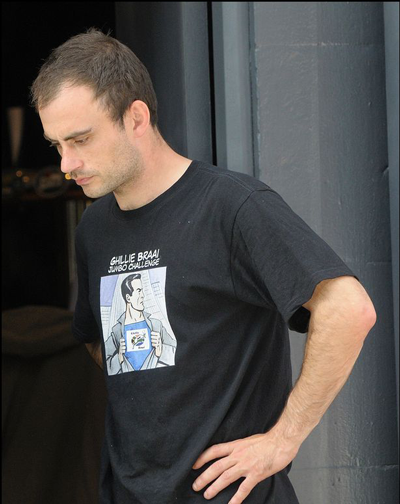 “We were confident that Mackie had served in the forces – but serious concerns were raised about Clayton’s background.” When confronted yesterday, Clayton admitted he wasn’t a war hero and had never served in the SAS. He said: “They’re not actually my medals. I borrowed them from Bill Mackie. You are allowed to wear these medals to show remembrance for others. “You have no licence to print my name or my picture. If you do, I will sue.” Mackie, of Lochend, Edinburgh, confirmed: “He wanted to borrow some commemorative medals for a remembrance ceremony so I said he could borrow mine.